InfoComm 2016 welcomed more than 38,833 visitors, 4.8 percent more than the last Las Vegas show. 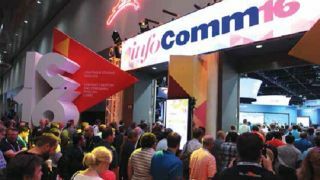 More than 35 percent of attendees were visiting InfoComm for the first time. The resounding echo from the AV punditry following InfoComm last year was about evolution versus revolution, and ultimately how that should be viewed positively, drowning out the naysayers that came looking for little else than the next earth-shattering gadget. While InfoComm 2016 is now behind us, such overarching labeling is largely missing, yet I’ve come to refer to it as “The AV Over IP Show.” The convergence buzz is indeed old news, but this year’s show was blanketed with ubiquitous AV over IP from most every vendor it seemed. A few of the more influential AV over IP introductions came from Atlona, with the OmniStream range of networked products for distributing 4K/UHD video, audio, and RS-232 control over Gigabit ethernet, using off-the-shelf switches; Aptovision’s BlueRiver NT+ chip, already embedded in several manufacturers’ products, with a compelling codec “shootout” demo at its booth; the latest range of networked AV solutions from AMX’s SVSi; and Crestron’s HD streaming transmitter/receiver (DM-TXRS-100-STR). That list is a very small tip of the iceberg in terms of what was displayed in this field across both halls of the Las Vegas Convention Center. In terms of noteworthy progression of convergence—or post-convergence if you will—InfoComm 2016 witnessed various manufacturers blur the lines between audio and video in their own identities. This was best demonstrated by significant introductions made from Biamp with TesiraLUX, adding networked video distribution to its DSP ecosystem; and QSC with the Q-SYS I/O-USB Bridge and two PTZ-IP conferencing cameras. Another example of this shift was on display at Crestron’s booth where the new product emphasis was largely placed on audio solutions, anchored by the new Avia DSP and amplifiers. Award-winning author, journalist, and radio and TV personality Stephen Dubner, of Freakonomics fame, delivered InfoComm 2016’s opening keynote presentation. This year might also be billed as the “year of the partnership” when you look into the collaboration space. We had Intel and Microsoft strengthening their commitments into AV, the latter with a bevy of companies boasting Skype for Business integrations, along with Surface Hub solutions and accessories. The partnership element was well exemplified at Revolabs, where the focus was on feature improvements, expanding its footprint in the conference room, and various degrees of integration and cooperation with the likes of Zoom, Google, BlueJeans, Vidyo, Telus Labs, and Cisco. While we’re on the subject of Silicon Valley heavyweights doubling down on the AV industry, Cisco’s long-predicted AVB network switch made its official entry to the market. Any trip to InfoComm would be incomplete without reference to the AV systems taken in off the show floor. In the fewest steps from the floor, many folks visited the brand new Westgate SuperBook, which drew even the non sports fans to drool over the 20-feet tall by 220-feet wide curved array of Christie Velvet LED tiles, integrated by HB Communications. It was interesting to note that video is distributed there by RF solutions from ZeeVee, reminding us that visual content is still subject to traditional modes of transport. The downtown area of Las Vegas had a few installs to note, with sound reinforcement spanning the Viva Vision on Fremont Street, employing 300 RCF HDL20-A line array modules and 50 subs in clusters lining the length of the street display, as well as three performance stages. Wireless networked loudspeakers and amps from Technomad were integrated by TeleData Technologies over a five-acre zone downtown. Recipients of the 2016 Michael Vergauwen Scholarships, each receiving $5,000 to support their audiovisual education. Pictured from left: Jeff Lipp, CTS-D, Lipp AV Design; Maria Gaitan, Groupo Niza; Richard Blackwell, Linked2 Software; Sarabeth Mullins, scholarship winner; Ron Camden, Biamp Systems; Lauren Belle Koske, scholarship winner; and Erin Bolton, Zift Solutions. In the more traditional show space, Cirque du Soleil’s The Beatles LOVE celebrated its 10-year anniversary with various show enhancements, including an upgraded audio system with eight Meyer Sound 900-LFCs and two Galileo processors, which now handle all of the main array processing. This is a show that aptly puts the spectacle in spectacular, and should not be missed by audio connoisseurs, theater arts lovers, or Beatles fans. I’d also like to give a nod to the healthy exchange of talent that continues in the industry, a good litmus test of the market’s strength. Stewart Filmscreen was perhaps the most high-profile example, having tapped former SurgeX executive Shannon Townley to its helm. QSC continued its hiring spree most recently with the addition of Mike Brandes from Vaddio (and an SCN contributor) and PR maven Kristine Fowler from Extron. AptoVision brought on marketing and communications specialist Janet Matey from Matrox. Collaboration newcomer wePresent hired former AMX VP of global education sales Michael Peveler, to lead global sales. Another SCN contributor, Randy Riebe, made his first major public appearance with Yamaha, at what was in my humble opinion the MVP of fun booth design; the Integrated Solutions Lab was outfitted as a chemistry lab, complete with playful beakers and lab coats for staff. Further talent acquisitions were afoot across the board. Lastly, the big corporate acquisition the industry was expecting to break at the show came along with the sale of the Bay Area audio pioneer Pro Media to Panasonic’s Enterprise Solution Group, which is the Japanese company’s North American arm focused on integrations. All of these trends, product introductions, and business shifts will be explored further in the coming months by SCN. Meanwhile, we look to you, our readers, to contribute thoughts and impressions from the industry’s flagship event with us online and across our social media channels.